Campaigners are pointing to new aggressive baby milk marketing practices in the UK as a sign of increased competition with Nestlé entering the UK market, where Danone is currently the largest company. Nestlé and Danone are respectively the world’s biggest and second-biggest manufacturers of breastmilk substitutes. They have been engaged in an increasingly aggressive marketing war, particularly in Asia, since Danone purchased the NUMICO brands in 2007 (Nutricia, Milupa, Aptamil, Cow & Gate etc). Update 11 April 2013: UNICEF Lao monitoring report exposes aggressive marketing practices, principally Nestlé and Danone. Policy makers have yet to implement internationally-agreed formula marketing standards in the UK, but there are some measures preventing the promotion of infant formula and using follow-on formula for cross-promotion. A new report from Baby Milk Action called Look What They’re Doing in the UK shows how the international standards and national measures are being broken. Baby Milk Action has pointed out that an EU export directive prohibits formula from being exported from the EU to third countries unless the labels are in the correct language and anyone who might be thinking of profiteering by buying formula from a UK supermarket to send to China will be putting babies at risk. Danone has gained extensive media coverage this week by calling on supermarkets to ration its formula to customers with the unlikely tale that so much is being purchased to send to China it cannot keep up with demand. If Danone was truly concerned about unofficial exports it would surely have tried to counter these by reminding people that should exports from EU countries are prohibited as the products are not labelled correctly for the destination country. Instead its suggestion of rationing is publicising its brands and there are reports of shortages due to panic buying. If Danone and the supermarkets (Asda in the above case) were really concerned about exports to China, then surely they would discourage exports by warning customers that such exports are prohibited and dangerous. Instead they are promoting the formula in breach of UK regulations by boasting of ‘increased demand’. 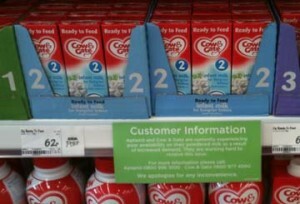 Baby Milk Action is reporting the above promotion to Trading Standards. Danone manufacturers much of the world’s formula in nearby Ireland, where it is trebling production to 100,00 tonnes per year with a target of providing 20% of global demand from there (which contrasts with breastfeeding, the best example of local production and consumption of food there is). Given the production capacity a short distance away, any shortages are more likely to be due to Danone prioritising its own shipments to China and elsewhere. Prices of formula in China have been increasing markedly in the past few years, with consumers paying a premium for foreign brandnames following contamination of the locally-produced Sanlu brand with melamine in 2008. Marketing practices are largely unregulated in China, competition is fierce and sales are growing exponentially, unlike in India where marketing is regulated (see Update 42). Baby Milk Action has asked the Advertising Standards Authority (ASA) to investigate Danone’s emails to members of the public on its contact lists about the claimed shortage. The ASA ruled in November 2012 that companies should not promote infant formula in direct emails and we have asked the ASA to investigate whether Danone’s emails are warranted. 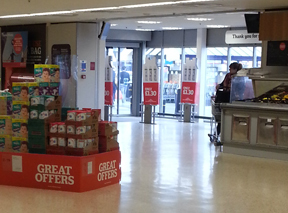 Nestlé has capitalised on Danone’s claimed shortage by stating it has no such problems with its SMA brand and this week launched a prominent discount promotion on its SMA follow-on formula in Sainsbury supermarkets (left). Baby Milk Action is calling for this promotion to be investigated by Trading Standards. As explained in the Look What They’re Doing in the UK it is prohibited to promote infant formula or to similarly brand products: although Nestlé is promoting follow-on formula, it is identically branded to the infant formula. Nestlé was asked by Baby Milk Action to address these issues following its takeover of Pfizer Nutrition, but has not done so. Formula is one of the most profitable products on the supermarket shelves and parents pay a permium to cover the costs of aggressive marketing campaigns, such as those documented in the Look What They’re Doing in the UK monitoring report. Short-term price discounts distort the cost of formula feeding. Baby Milk Action is calling for permanent price cuts by stopping all the expensive promotional activities. Over 1,000 people have already signed the No promotion – Cheaper formula petition. Anyone concerned about being unable to locate a particular brand of formula should heed the Department of Health advice that as all formulas have to comply with composition standards there is no reason to choose one brand over another and it is possible to switch between brands. 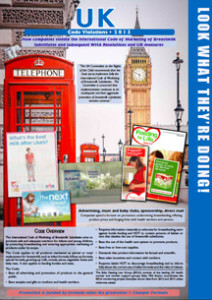 Baby Milk Action interviewed health experts for the Infant Formula Explained DVD, which is being used in NHS facilities. Experts explain that the child’s preference and price considerations are as good reasons as any for selecting a brand as the claims companies make to promote their products do not stand up to scrutiny. Indeed, after complaints registered by Baby Milk Action, the Advertising Standards Authority (ASA) investigated claims by Danone and Pfizer Nutrition/Wyeth (prior to the Nestlé takeover) that Aptamil and SMA are the ‘best’ formulas – the companies were unable to substantiate these claims. Nestlé and Danone are both profiled in the Breaking the Rules, Stretching the Rules 2010 monitoring report from the International Baby Food Action Network (IBFAN). In response to the report Nestlé said it would act on just 3% of the violations in its profile. Danone claimed to have already taken action to stop 50% of the violations in its profile. Nestlé is the target of a boycott, which forces some changes in marketing practices and policies, and Danone has been warned it may also be targeted with a consumer campaign if it does not address all concerns. Breastmilk substitutes are not included in the list of Nestlé products to boycott as there may be times when these are the only ones available for babies being fed on formula. In February 2013, Save the Children launched the report Superfood for Babies, which also cites violations by Nestlé and Danone. As the Look What They’re Doing in the UK report shows, both Danone brands and the SMA brand now owned by Nestlé are aggressively marketed in breach of international standards and national measures. Campaigners fear that the situation is already deteriorating as the Danone v. Nestlé marketing war reaches the UK.